Vivienne Williams was born in Swansea in 1955. She studied English Literature at Reading University taking a Masters Degree in ‘The Literary Response to the Visual Arts’ in 1978. She spent the next five years abroad, teaching English in Venice and Padua and working in an art gallery in Sydney where she began selling her work for the first time. Returning to the UK in 1983 she spent the next seven years studying and working in a Buddhist Community before becoming a full time painter in 1990, returning to Wales at this time. Her early work was expressive and very colourful, the subject matter mostly flowers. For the last thirteen years she has concentrated more on still life painting, her palette constantly evolving, her style distinctive. 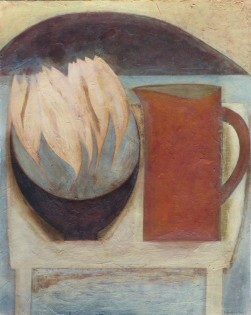 She has been quietly building a reputation as a significant artist in Wales over the last twenty years with regular solo exhibitions in Attic Gallery in Swansea and Martin Tinney Gallery in Cardiff, exhibiting with the latter at the London Contemporary Art Fair and the British Art Fair from the early nineties. She was a prize-winner at the National Eisteddfod in 1993. She received a highly commended prize at the inaugural Welsh Artist of the Year competition in Cardiff in 2000 and was invited to be on the panel of judges in 2008. Her work was purchased by CASW in 2003. She began exhibiting with Thackeray Gallery, London in 2015 and had her first solo exhibition with them, in 2016. ‘I paint flowers, fruit, pots, jugs and bowls – often on a table, lately with more views from the window, some objects in open landscape. Everything in the picture is rearranged and repainted many times, deciding what to leave in and what to leave out is a balancing act. The spaces are as significant as the objects themselves. As the layers of paint build, the surface texture is energetically worked, scratched, sanded and stained. It always surprises me when a battle on the paper resolves itself into a calm painting’. 1980 - 82 Worked as a gallery assistant in Sydney, Australia. Attended drawing classes and began to sell work. 1983 - 90 Studied and worked at college for Buddhist Studies, England. 1994 - 96 Lived and worked in Nuremberg, Germany. 2018 Seventeen Solo shows to date.